This has been on of my favorite places in the Twin Cities. A peaceful scene is right in the city of Minneapolis. Plein Air.Oil Painting.12" x 16"
Paintings are available unless marked sold or pending. For purchasing information please email me. 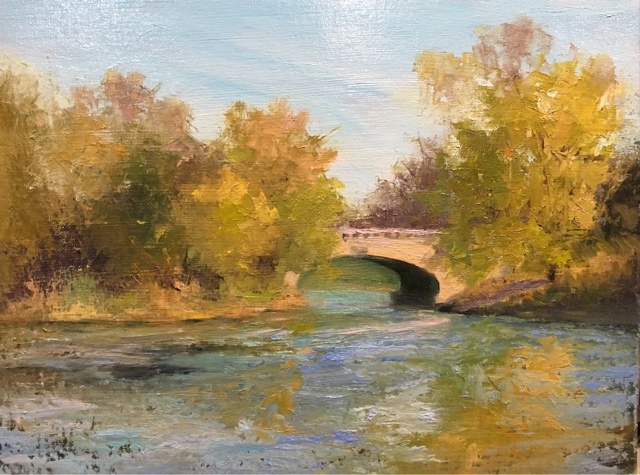 Judith’s primary focus is Plein Air landscape and still life painting. She was trained as a commercial artist, has studied Atelier drawing and painting, and trained with Marc Hanson, Stapleton Kearns, Michael Klein and Jeffery T. Larson and other highly regarded artists. Judith knew from a very young age that she wanted to be an artist. She spent a significant amount of time looking at the colors and textures of paintings, and how they combined to create a beautiful piece of art. Judith regularly visited the woods and creeks near her home and recreated her observations in drawings and sketches. She was drawn to Impressionist artists because of their use of color and the personal interpretation of the subjects they observed. Over time Judith also studied the works of Joaquin Sorrolla, John Singer Sargent, Aldro Hibberd, Emile Gruppe, and a number of Russian landscape painters. Judith’s primary medium is oil and her main interest is Plein Air painting. Judith enjoys the challenges the changing light and vista present as well as the fresh air, sounds of the birds, wind, creaking of old trees, and water moving through a creek. Judith lives and works in Minnesota with her husband, son, daughter, and four dogs. Wayzata Art Experience 2015 Second Place award.